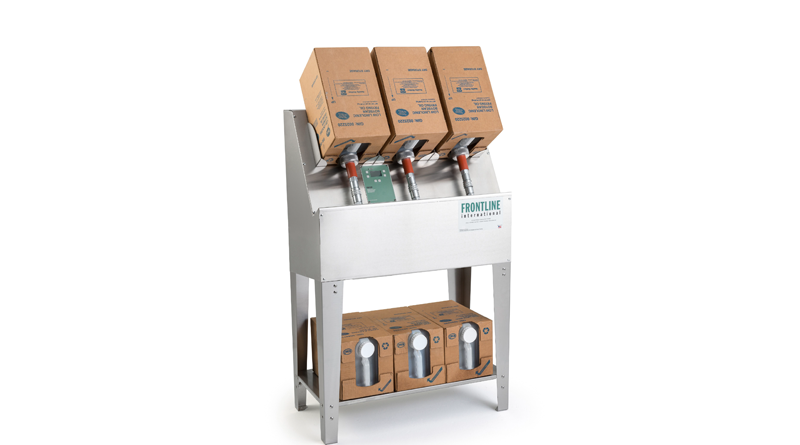 Frontline International has redesigned its signature EZ Oil™ Fresh Oil Dispensing System to dramatically increase capacity. The patented EZ Oil process employs boxed oil, held in an inverted position, that is plumbed to a reservoir. With the redesign, the depth of the reservoir has been more than doubled, which also more than doubles its shortening capacity. EZ Oil’s integral pump moves oil at the touch of a button from the reservoir to awaiting fryer vats. Over and above the filled reservoir, the unit racks more plumbed boxed oil, helping to ensure the reservoir remains filled and ready. Because this reservoir is now 10 inches deep, up from 4 inches, it will hold 350 pounds of shortening, up from 140 pounds. The new, greater capacity accommodates the industry’s largest fryers, and also is ideal for kitchens with several fryers that need to be plumbed in a chain using a single, automated dispensing system. The centerpiece of Frontline International’s Smart Oil Management™ systems, EZ Oil is the convenient, safer, and more cost-effective way to refill fryers with fresh cooking oil. Upside-down storage dispenses every drop of oil, increasing yields by up to 10%. Whether the system is direct-plumbed or implements the dispensing wand, fresh cooking oil flows freely and easily from the boxes on the rack into the fryers. This system can dramatically improve workplace safety, as hands and floors are kept clean and grease-free. Frontline International, Inc. designs, manufactures, and distributes superior commercial foodservice equipment for the storage, handling, and disposal of cooking oil. Customers own their own equipment, negotiate their own oil rebates, and have the freedom to choose their own oil vendors. Frontline International and its Smart Oil Management systems offer users more freedom and more control over their processes and their profits. For more information, contact Frontline International, Inc. at 187 Ascot Parkway, Cuyahoga Falls, OH 44223. Phone: +1 330-861-1100. Toll free: 1-877-776-1100. Web: http://www.frontlineii.com. Email: info@frontlineii.com.